The Oracle Database Security Assessment Tool (DBSAT) analyzes database configurations and it tells us uncovers security risks and improves the security posture of Oracle Databases. We can use that report to fix immediate short-term security risks and build&develop security strategy for our databases. DBSAT analyzes information on the database and listener configuration to identify configuration settings that may unnecessarily introduce risk. Please do not forget DBSAT supports Oracle Database 10.2.0.5 and later. The figure below summarizes the security status of a sample database and categorizes its findings by risk levels. 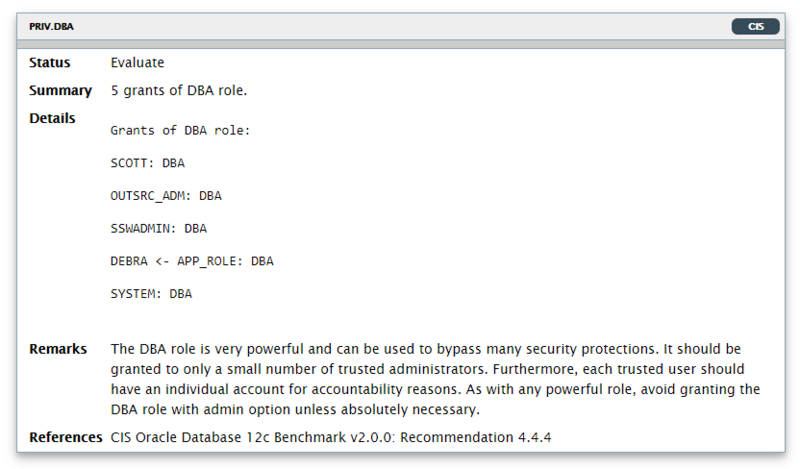 The Finding below show which users have the powerful DBA role, and how that role was obtained (directly granted, granted via another role). DBSAT also scans the database metadata for sensitive data using customizable regular expression patterns, and reports on the amount and type of sensitive data found. « Is 18c available on-premise?